Krystal is a licensed veterinary technician that earned her Associate of Applied Science degree from Baker College. 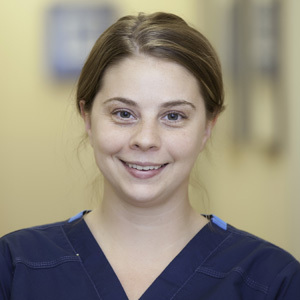 Prior to joining AEC she completed various externships for emergency medicine and exotic animal care, and since joining AEC she has done extensive CE work, including participation in the 2011 AAHA national conference. Krystal has a strong desire to learn and develop professionally. Her positive attitude is refreshing for both our clients and our team. "I love the fast pace and friendly atmosphere at AEC. We offer the best medicine anyone can provide, and I do my best to help educate pet owners about their pets and help them in any way possible. Krystal enjoys being outdoors and spending time with her family and friends. She likes ice fishing, boating and entertaining her one cat, Ronald, who is 9 years old and her 1 1/2 year old German Shorthair Pointer, Lotty (pictured).